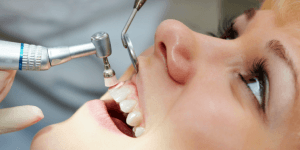 Do you know how often you should have your teeth cleaned? Routine cleanings are recommended twice yearly, or once every six months. It is possible that you may need to have a cleaning performed more often depending on the health of your gums and teeth. Dental cleanings do not just involve a simple brush and floss of your teeth and a routine cleaning goes deeper than that. When you come into our office, a dental hygienist will perform the cleaning with both cavitron machines and scalars. A cavitron machine is considered an ultrasonic scalar and scalars are tools that are used to remove tartar and plaque from your teeth. The cavitron machine is a bit different than the hand held tools and it vibrates rapidly at a high frequency. If you are wondering what the purpose of a routine cleaning is, it is to remove all tartar and plaque from your teeth. When a buildup of tartar and plaque is allowed, tooth decay will form and you may even develop gum disease. To stop this from happening, a routine cleaning is recommended along with preventative maintenance at home. 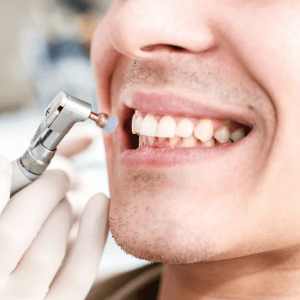 If you are ready to have a routine dental cleaning performed, contact Access Dental Care today. We recommend that a cleaning be performed on those patients who are not experiencing any bone loss, gum disease, or severe tooth decay. If you do have any of the mentioned oral problems, your situation will be different. A cleaning cannot be performed on those who have oral conditions because the teeth may move around, bleed, or hurt the patient. At Access Dental Care, we will work with you to determine the best treatment and cleaning routine. Patients who receive a regular teeth cleaning keep their teeth longer than those who do not. In addition, cavities are caught almost immediately and the patient does not tend to develop gum disease or other oral concerns. Most patients who experience tooth loss are those who have gum disease, which results from poor oral care. If you are experiencing tooth pain or you think you may have a cavity, schedule an appointment today by calling our office! How Is a Routine Cleaning Performed? The first step to a routine cleaning is scheduling your appointment at Access Dental Care. When you come into our office, we will welcome you with open arms and you will fill out paperwork, which will include your medical and dental history. Once the paperwork is completed, we will then give you a tour of the office and take x-rays of your teeth and mouth. These x-rays will be used by our dentist to ensure your oral health. If any problems are located, they will be discussed with you after your cleaning. When it is time for your cleaning, your dental hygienist will begin by cleaning your teeth. A typical routine teeth cleaning will take about 45 minutes to complete. Children take about 30 minutes. If your teeth are ever cleaned in any less time, it is unlikely that they were properly cleaned in the first place. All dental cleaning should involve the use of scalars and then a polishing. The polishing part of the cleaning is performed with a dental tool that has a rubber cup. This rubber cup rotates on each of your teeth to polish them and remove any additional plaque. Your dental hygienist will place a cleaning paste inside of the cup. The paste has a consistency like that of sand. After the polishing, your dental hygienist will floss your teeth to remove any residue that may still be trapped between your teeth. If you have braces, connected crowns, or a bridge, your hygienist will use a specialized tool to floss your teeth properly. If the flossing step is skipped in your dental care routine, your teeth are only being cleaned about 60 percent of the way. ALL teeth need to be flossed to ensure no food remains. If you do not know how to properly floss your teeth, talk to your dental hygienist and they will teach you how. If you are in need of a routine dental cleaning, contact Access Dental Care today. We recommend that you maintain a good oral regimen at home and use a soft bristle toothbrush. Remember, routine dental cleanings are not an optional part of your oral care and are required to maintain healthy teeth and gums. Call Access Dental Care now to schedule your appointment.